The retina, the light-detecting area at the back of the eye, contains three types of "cone" cells, which are the ones responsible for detecting colour. Each type has a different pigment which makes it respond to a particular colour of light. Some cones respond to red light, some to green and some to blue. This property of the eye means that all of our imaging technologies, from traditional film photography through to digital video, only need to record the amount of red, green and blue (RGB) at each position in an image, rather than the full spectrum of colours. The eye then has enough information to reconstruct (almost) any colour in the images, as we shall explain. Objects which predominantly emit or reflect red light are detected strongly by the red cones but not by the green or blue ones and therefore we say the object is red. Yellow objects are those which emit or reflect almost equal amounts of red and green but no blue. In the picture on the left, red increases up the left hand side, from zero (black) through dark red and then lighter shades to brightest pure red. Along the bottom, green increases from zero on the left to maximum on the right. At any position inside the square there is a combined amount of red and green, more red if near the left side, more green if near the bottom. 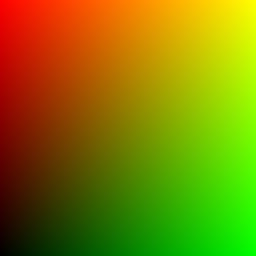 Along the rising diagonal there is always an equal amount of red and green so the eye perceives shades of yellow, from zero in the black corner to brightest yellow at the top right.